A Ceiling\wall mounted holographic display. Designed to be used with my Steampunk Corridor sets, but can be used with any Poser\Daz Studio models. 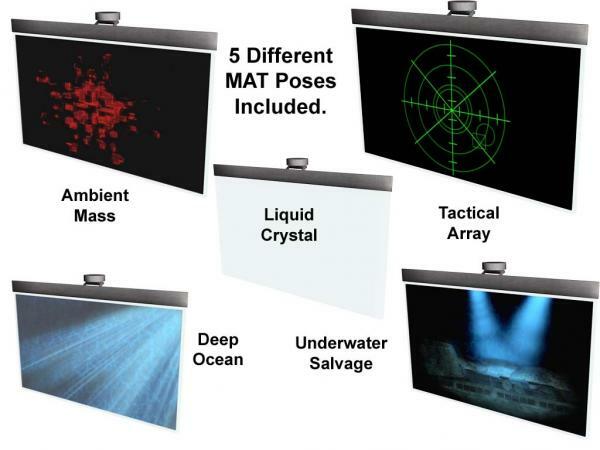 Set consists of a 3 piece prop (Base unit, posable arm, 3D Holographic display), and includes 5 Mat Pose. It was designed in Hexagon. Included MATs and PP2 and OBJ file for easy use in Daz Studio, Poser and other 3D software packages. Free for non commercial use. See Readme file for commercial use. Credit for the water texture goes to abraxal (http://www.sharecg.com/v/655/View/6/Texture/Water). I missed this earlier. Thanks, very useful. MurbyTrek (7 years ago) Inappropriate? comes in very handy.thank you very much.